Heya Meghan and crew. Le Camping is French for "The Camping". Just trying to help. Non, je n'aime pas le camping. Nous avons inventé les hôtels! Give that girl a grate. Music level sounds lower than normal? Or is it just me? Let me guess ... the kid in the background is pitching le tent? L'important c'est d'être au-delà du bruit et des attributs de la soi-dite civilisation. La tasse est tres grande, n'est-ce pas? It looks as if she's frying up a batch of air. So I missed the World Cup. Damn time zone confusion! Perhaps there's some fresh truite just out of view. next time the guy can cook and she can put up the tent. PIL is sounding a wee bit like Chumbawumba. i bought some very cheap neon body paint and the only practical use I think I can use it for is sporting events. Or your Blue Man Group cover band. I hope the people that buy it don't raze it and put up a McMansion. I hope Susan Dey buys the place. which of the Brady kid actors had drug problems? Elwyn, which ones didn't is a better question! If you haven't read the book Growing up Brady, I highly recommend! Diggin' this set mucho, mucho. Thx, Ms. Meghan. hey does alice come with that house? i really want to go le camping now. 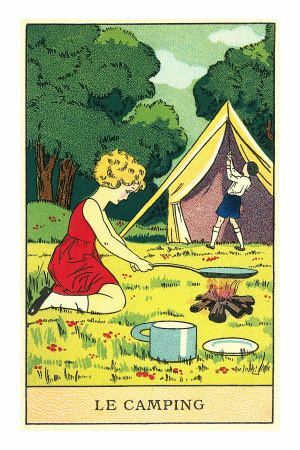 I like the way that girl is flipping the little boy in her frying pan. ...while adjusting the tent flap. Good work, Jack. it's all an elaborate circus act; but the boy will probably retire young. dumb work always getting in the way! See you next week! Like this Hit Town, my sweet spot. Merci, Meghan. Back to dry land for now, I guess. Gotta unfog my diving mask. Thx, Meghan. See you and all again, getting in over my head yet once again. Bye! Mark Hurst has told us to delete our FB accounts. Swimming to shore. Later, all!